Turtle facts for Kids ! 1. How many kinds of turtles are there? 2. How long have turtles been on the earth? 3. Where do turtles live? The Desert Tortoise lives in a hot, arid environment, eats grasses, and has stumpy feet with toes that are not webbed. The Malayan Box Turtle lives in a hot, humid, aquatic environment, eats everything, (plants, fish, snails, worms, etc.) that it finds in the water, and has webbed feet. The Diamondback Terrapin live in brackish (slightly salty) lowland coastal waters of the eastern and southern United States has fully webbed feet and stays in the water most of the time. It eats crayfish, snails, fish, insects and worms. 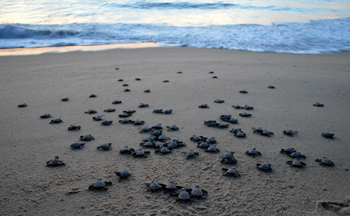 There are a variety of Sea Turtles that stay in the ocean all the time, coming ashore only to lay eggs. They have flippers. They travel all over the world. 4. Do all turtles have shells? Yes but not all the same kind. 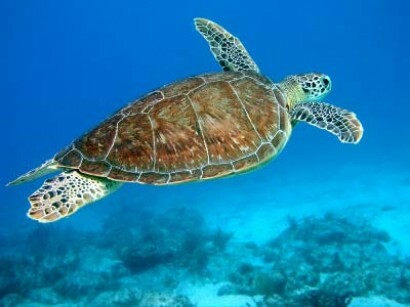 All turtles have some type of shell, but there are big differences in the protection those shells provide. Some turtles, such as the American and Asian box turtles, have a hinge on the lower shell which allows them to go inside their shells and then close up the "doors," front and rear. The American mud and musk turtles also have hinges, but can't completely close up. Aquatics such as the painteds, cooters, sliders and map turtles have large protective shells, but no hinges. Flesh is exposed, front and rear, even when the turtles are completely tucked in. The Snapping Turtles are not very well protected by their shells. The lower shell in particular is tiny and doesn't begin to cover the animal. They are shy, not inclined to look for trouble, but if threatened, they will put up a fierce fight. The Softshell Turtles have leathery shells, a type of thick skin rather than the hard scutes that other turtles have. They stay hidden in water most of the time, and use camouflage for protection. They are also quick to bite if necessary. 5. Can turtles take off their shells? The turtle's outer shell is made of a thin layer of keratin, like your fingernails. But underneath that layer, there is a layer of bony plates that give the shell its shape. The ribs and vertebrae (backbones) are part of the shell too. So removing the shell would remove part of the skeleton of the turtle. There's a drawing of what the bony part of the shell looks like here. The labels are not in English, but you can see why it's impossible for the turtle to take off its shell.